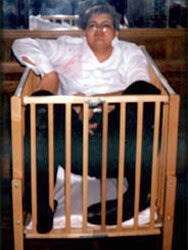 "The Fat Drunk Guy in the Baby Crib"
Okay, we begin our fan profile at the very end of the Rockycon. Mad Man Mike was having an after-the-con party in his room. I (Bill Brennan, NYC cast/Official Shock Treatment cast) was walking towards the party room with my friend Perre Poley (in full drag)., Someone ran up and said, "Bill, do you have a camera???? Mike needs you!" I was then led to Mike's room, when a strange smell hit me. I asked what the smell was, and as told that it was vomit, and that I should check out "the fat drunk guy". In the next room, in the center of about 50 or so people, was the fat drunk guy. He was slumped over in a chair. His eye were shut, he was snoring. Vomit dribbled down his chin and all over his shirt. His stomach was oozing over his belt. I asked what his story was and no one knew who he was! He came into the room and sat down in the chair. He had his own booze, and drank a lot of it, and did not talk to anyone. He finished his wine and closed his eye and went to sleep. Then, still asleep, he started to vomit on himself. This is serious, as a sleeping person can choke to death this way... that's when I came in. Well, he was a hazard to himself to others (the smell was awful!) so an unwanted obligation went to us, so we decided to go through his pockets and get his room key and dump him in his room. His pockets were empty, no key or ID. We didn't know who he was or where he came from, but we knew we wanted him gone. Mike had the idea of sending someone out for a wheelchair. A few of us sped off in search of one. While we waited we took photos, drank, smoked and had a blast. Someone came back, but had a wheeled baby crib instead of a wheelchair. "it's all we could find" was the reason. Well, beggars can't be choosers. We gathered five strong men. First, three of us tried to lift him but we dropped him on the floor. Now here is the fun part - we wheeled him down the hall - one fat drunk guy in a baby crib followed by 50 RHPS people, all in costume, drunk and laughing as loud as they could. We wheeled him into the elevator and pressed the CASINO button. As the doors started to shut he opened his eyes, gave us all the finger, and was gone. We went back to the party room, and everyone had to step over or around me, Gene Chiovari, and a few others that were laughing on the floor. The party resumed for about 20 minutes until Hotel Security came to boost up the fun. The head officer was pretty mad, the fat drunk vomited over two of his officers in the lobby as they hauled him out of the crib. The party was over, but not the story! The drunk guy was taken to the local drunk tank because he was intoxicated and had no ID. When he woke up he was missing his shoes, shirt, and sock. The other drunks robbed him during the night! He checked himself into rehab the next day, did not remember the events of the evening and had since quit RH and dropped out of the scene.